Baklava is one of the divine desserts that I was introduced to, after coming to the US at a Greek restaurant. That first bite made me a big fan of this dessert. A number of countries have claims as being the origin place for Baklava including Greece, Turkey, Lebanon, Afghanistan, Iran and so on. 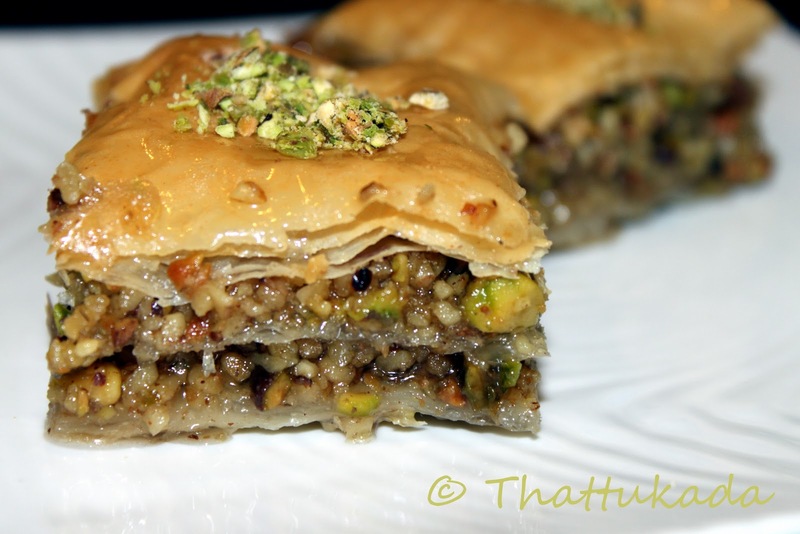 It is a rich flaky pastry made with phyllo sheets filled with chopped nuts; nuts used could be almonds, walnuts, pistachios, etc sweetened with a simple sugar syrup known as 'Atyr' or 'Atir'. I have looked all over the internet for the perfect recipe and this is a combination of multiple recipes (allrecipes, dedemed, etc). It did come out great! 1. Boil the water and sugar together in a pan until the sugar completely melts in. 2. Add the honey and let the mixture simmer. 3. Add the lemon juice and let it boil for 10 minutes. 4. Add in the rose water and boil for another 10 minutes. Atyr or Simple Syrup is ready. This needs to be refrigerated before using in the baklava. I made this a day ahead and refrigerated it. It is also a perfect syrup for pancakes. 1. Chop the walnuts and pistachios into small pieces (you can see the size up to which the nuts need to be chopped from the picture). I used slightly salted pistachios. You could use the nuts of your choice; just use a total of 16 oz. 2. Dry roast the chopped nuts for around 5-7 minutes in a medium flame. Do not let it brown. 3. Once roasted, let it cool for 10-15 minutes. 4. To this, add sugar, cinnamon and nutmeg powder and mix well. 5. Melt the butter in a bowl. 6. Butter the baking pan generously using a brush dipped in melted butter. I used a 9" x 13" disposable aluminium foil pan. 7. Unroll the phyllo sheets carefully. You need to work quickly on these sheets, else they dry up quick. You can cut the entire roll to the length of the pan, if needed. I just folded the edges to meet the size of the pan, as and when I was placing each layer. That worked well too. 8. Butter each sheet generously and place in the pan one over the other. The numbers of layers needed is up to you. I placed 8 sheets at the bottom. 9. Now spread half of the chopped nuts evenly on top of the 8 layers of phyllo sheets. 10. Butter another 5 layers of thin phyllo sheets one at a time and place one over the other. 11. Spread the remaining nuts evenly on top of this second layer of phyllo sheets. 12. Add 7 more layers of phyllo sheets on top of this after buttering each layer. Butter the top layer as well. 13. Now carefully cut this into the required shape you need. Do not cut completely through the bottom. This will help the sugar syrup to not go to the bottom of the pan and prevent soaking the phyllo sheets. 14. Bake for 30 minutes in a 350 degree F preheated oven. 15. Pour the refrigerated simple syrup over the baked baklava immediately after taking out of the oven. 16. Serve when baklava cools down. Do not cover the baklava as it may get soggy. 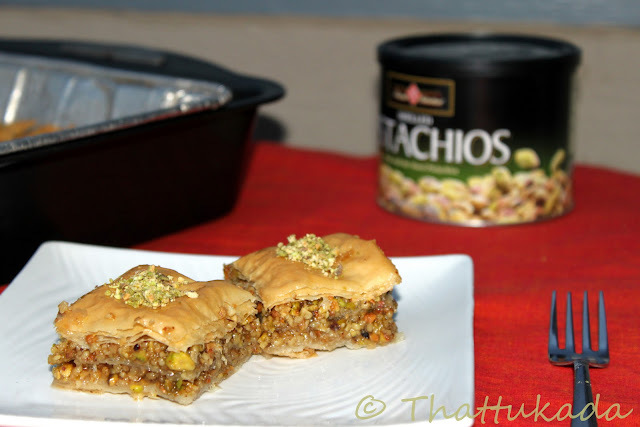 Baklava should remain crisp even after all the syrup is absorbed in.Garnish with some powdered pistachios. If you are a dessert person, I am sure you will fall in love with this. The only problem with making this is you cannot just stop at that first one. So I would suggest you make it when you have a party or share it with your friends; if you are not bothered about calories, then don't even worry - just go ahead and make it. Sending this Baklava off to Meeta's Monthly Mingle - Taste Lebanon event hosted by Bethany of Dirty Kitchen Secrets. Looks yummy... Never tasted this though.. I never say no to baklava, my all time fav..Very tempting clicks Fathima.. Perfect Baklavas..the pics are very tempting! Never Tasted this but I bet this would have tasted heaven !!! Woow...they look gorgeous!!! Am stop staring at them, praying they pop out of the screen into my mouth :-)thx for wonderful recipe..bookmarked!! They look wonderful..sounds super delicious dessert. 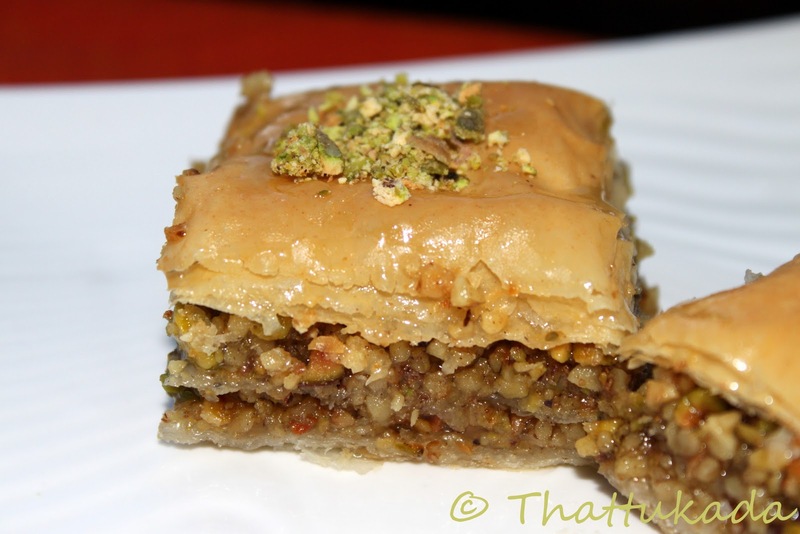 Baklava looks fabulous Fathima,been a long time since I had some. Looks delicious. I love them. Nice . This looks fabulous!! Very tempting pictures..
Never heard of this but looks great and yummy. Thanks for visiting. MG!! am drooling.. ur clicks are mouth watering!!! !baklava is one of my fav arabic sweets! !...i prefer the home made baklava, to the ones we get from the bakery..though loaded with melted butter,i think they are not sweet enough as the ones we make at home. ur recipe and clicks make it obvious that its perfect !!yummyyy!! the pictures only testify how good they tasted...perfect recreation of this classic dish Fathima. love it. lovely dish. wonderful recipe and wonderful pics. Baklava is my utter weakness! so you can imagine how glad i am you are bringing this along to the mingle. thank you so much for taking part in the MM this month! Your baklava looks wonderful too bad I can't reach through this screen and grab it. They are so moreish- so dangerous but who cares! you only live once. Thanks again for participating! I've eaten my fair share of baklava and I made one with macadamia and manuka honey once...They're healthy after all, I'm SURE honey is good for you, right? Looks delicious. You did a great job here. To me, baklawas are absolutely irresistible! I am just having a cup of tea now and would love to try one of yours! I love this recipe. Fathima, am searching for a sweet made with Jack fruit. Its a kerala delight. The sweet can be stored for 3 months atleast. I have tasted it. But I do not know the recipe. Pls let me know if you have tried it. Thanks. Cooking is my passion and this blog has a collection of my cooking experiments. Your feedback is what keeps me going. So please do not forget to leave your comments or suggestions. You could also email me at fathimasthattukada@gmail.com.